We are extremely happy to announce our relationship with Homepin, and the distribution of Thunderbirds Pinball machine in the Australian marketplace. Highway Entertainment was the last distributor in Australia to distribute Williams/Bally pinball machines before they closed and have been in the pinball distribution wilderness for the last 19 years. We have started to re-establish our distribution network in Australia and will be making a number of new distribution agreements and product announcements over these next months. 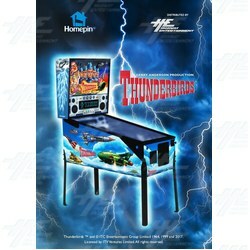 Thunderbirds Pinball machine is based on the hugely popular UK science-fiction television series and lovingly recreated by Homepin as a modern pinball machine. Unlike other machines available, the Thunderbirds Pinball machine will not have optional extras and will include items such as coin mechanisms and shaker motor as standard. Whilst other factories are offering limited warranty, Highway will go further and add additional warranty to include 2 years unlimited warranty (whether you use in commercial or home environment) on all major components. Please click to review current special offers available. International customer - we can also service your needs with door to door service, or, if you would like to distribute the product, let us know and we will help with all arrangements, promotions, logistics and support.